For today’s devotion, I would like to talk about money and stewardship, not as a financial expert but as someone who also needs to be reminded about being good at handling the things that God has entrusted to me. When I was young, the parable of the talents was one of the bible stories that I always hear during Sunday School. Let me share it to you (for those who don’t know about it yet). 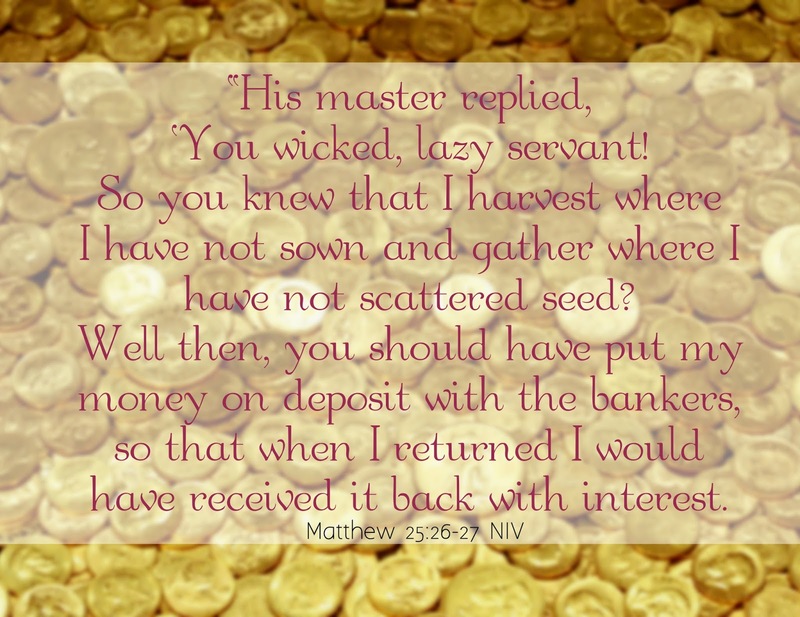 This parable is found in Matthew 25:14-30. Some bible commentators say that the Parable of the talents don’t just talk about money and investing. It also talks about the talents and skills that God gives us – that if we don’t use them well, they might be taken away from us and be given to someone who would do well in improving them. Let’s say someone has a talent in singing, he knows he can sing and has a good voice but didn’t do anything to improve it or didn’t use it to honor and glorify God, it could be taken away from him and be given to someone who’s ready to use it to worship God. Stewardship means the management or care of something, particularly the kind that works. We are considered stewards of God’s blessings and we have to be good stewards in order to be more excellent at it. What are the things that you are good it, again, this is not just money: are you good at singing, writing, dancing, poetry, planning, organizing, etc? Use if for God’s glory and you’ll even more be blessed. Even though Stewardship doesn’t just talk about money, it still has a great impact when it comes to handling finances. Sharing with you this 10 Money Principles that our kids should learn as early as now. I hope this helps other moms like me in raising our children to become more responsible when it comes to money. This infograph sent to me by MoneymaxPH. Save early and save often is very important so you have something to use in case of emergency. I must admit, I'm not familiar with that parable. Thabks for sharing. You're right, we should enhance our gifts more to glorify God. Love this, Nilyn! It really spoke to me, now that I'm "obsessing" over how to recover from months of spending all our salary and leaving nothing for our savings. Thank you for the Biblical reminders! Yes! this is something I want my son to learn one day..to save for the rainy days. Thanks for sharing. Saving is very important especially to those who are starting to build a family. Thanks for sharing! You're welcome Maan! Is it ok to say that I somehow "envy" you for doing that? haha. Grabe, sarap kaya mamili ng mamili. lol. You're welcome! Yes, I strongly agree with you! Saved the infographic and will print it so my boys could take a look and learn as well. Would love to share this with them. This is such a great reminder. This is not just for kids but for everyone. We have to grow whatever blessing we receive. Thank you for this reminder, saming dalawa ni hubby siya ang magaling humawak ng pera samin. Ako kasi laging make up ang nasa isip lols. Yes, even I, needs to be reminded of this. hehe. Haha. Kahit ako, di rin, lol. Pero buti nalang di pa huli ang lahat. haha. Yes! That's true! And I hope I'll be a good steward, always. hahaha! Ok lang, ang galing mo din naman mag make up gaw, lol!